I recently finished a book I found at my in-laws house called Choosing Civility: 25 Rules for Considerate Conduct by P.M. Forni. I've been really interested in "being classy" lately, and I was excited to read something that might give me concrete ways to improve my behavior. Forni's book first outlines the history and etymology of courtesy, then illustrates 25 ways to practice this civility in every day life. Some background on Forni—He was a successful literature professor at the University of Pennsylvania who realized that he would be a failure if he taught his students how to analyze Dante but didn't teach them how to treat each other with kindness. So he started "The Civility Project" at Johns Hopkins in an effort to assess the significance of manners, and politeness in contemporary society. You can read more about the project itself here. Choosing Civility explains courtesy this way: In medieval times, there was a certain code or list of rules you had to use when conversing in COURT or with royalty. Some of them were arbitrarily designed and others had considerable thought and meaning behind them. Those behaviors were (and are) associated with superior qualities of character and expected in those close to royalty. Therefore, as we practice handling ourselves and those around us with care, we acknowledge the royalty within us all. "With a training in civility we develop the invaluable habit of considering that no action of ours is without consequences for others and anticipating what those consequences will be. We learn to act in a responsible and caring way. Choosing civility means choosing to do the right thing for others . . . The byproduct of doing justice to others is the enrichment of our own lives. I hope that we will never tire of rediscovering that being kind is good for the [human]kind." 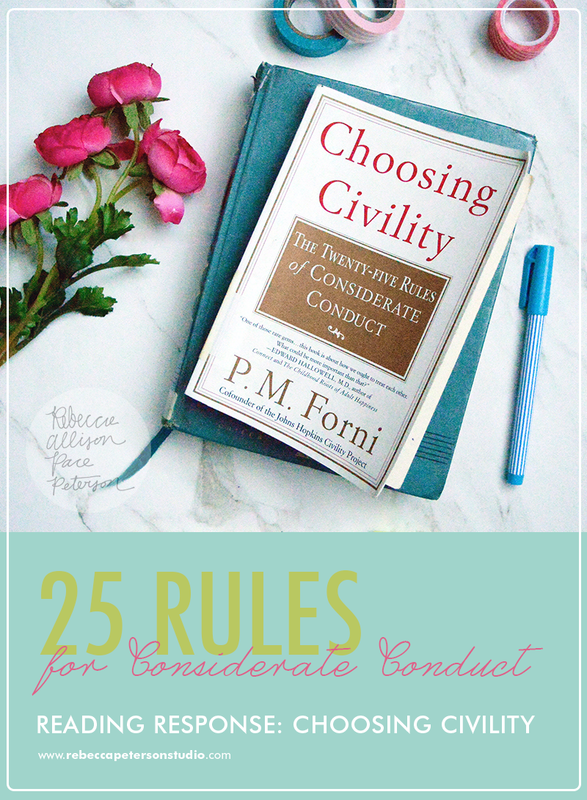 25 Rules for Considerate Conduct based on the book "Choosing Civility" by P.M. Forni. Very practical and easy-to-use advice! Choosing Civility was a great reminder for me to evaluate the way I treat people around me, especially at work. I'm going to make a greater effort to get along with people and let my behavior help them, not hurt them.